March 26, 2012, 10:10 a.m.
By Justin Ellis @JustinNXT March 26, 2012, 10:10 a.m.
Mohamed Nanabhay likes to talk about something he calls “distributed distribution,” which, aside from being delightfully alliterative, might be a kind of rallying cry for the future of media. That’s a strategy that has worked for Nanabhay and Al Jazeera English: the site’s videos on YouTube generate around 2.5 million views a month; they have almost 1 million Twitter followers and just as many likes on Facebook. Maybe more importantly, Al Jazeera has turned around and used those alternate channels to bolster their news gathering, particularly throughout the events of the Arab Spring. Nanabhay is stepping down as the online chief for Al Jazeera English and is planning his next big venture. But it’s worth looking at his time at Al Jazeera because it’s likely the idea of “distributed distribution” will be one of his legacies as it played a role in transforming the website of the Middle Eastern broadcaster into a experimental online news operation in itself. “We’ve done some great work over the years, especially the last two years with our coverage of the Arab Spring, and we built the website up to a place where I’m quite proud of it and quite happy both with the journalism we do and the form that we do it in,” Nanabhay told me. Nanabhay has been with Al Jazeera more than 7 years, starting as the head of new media, a kind of digital projects division that allowed Nanabhay and his team to experiment with many of the things that are common practice at Al Jazeera English today: using social media in reporting and distribution, cultivating video from citizens, exploring the use of mobile tools for news. One of the biggest accomplishments during his time was the decision to allow Al Jazeera footage to be licensed under Creative Commons. As he prepares to leave two months from now Al Jazeera English is poised for more growth, establishing a foothold here in the U.S.: at least 40 percent of the traffic to Aljazeera.com comes from America. And then Tunisia, Yemen, and Egypt happened. A sizable chunk of Al Jazeera’s coverage area in the Middle East was in upheaval. As the job of reporting in many of these countries became more difficult, either due to violence or state censorship, the reporting output switched to the web. Nanabhay said one thing that is overlooked when considering the role social media played in their coverage is the fact that Twitter and Facebook would not have been effective if Al Jazeera’s journalists weren’t familiar with the people, activists and other groups providing updates from the ground. “The use of citizen media, both in terms of being able to find the information, verify the information and then produce it was obviously challenging, especially at the height of the Arab Spring when a lot of this material was based off citizen media,” Nanabhay said. As ready as they may have been, it did require realigning Al Jazeera’s newsroom to focus attention on the flow of information online. Where tweeting and blog updates had once been a secondary concern, there were now dedicated staffers covering those jobs around the clock. “Previously, you relied on your correspondents and your wires or other news organizations, and suddenly you’re relying on the Internet effectively,” he said. One thing Nanabhay is particularly proud of is the evolution of liveblogging on Aljazeera.com. The format made sense during the early days of the revolution in Egypt as well as the protests in Yemen, when news would come in through short bursts that would typically not be big enough to carry a full story. It wasn’t long before they saw a change in where eyeballs where going on the site. “After a couple of days of doing this we noticed that at certain points in the day our liveblog would have 10 times the amount of traffic on it than the lead story would have,” he said. As with most broadcasters, video remains a very big driver for Al Jazeera, and that was no different during the Arab Spring, where views of the network’s live feed jumped 2,500 percent during peak Egypt coverage. But Nanabhay said the attention to the liveblogs continued to increase as well, and they now have liveblogs with a constant stream of news for Bahrain, Afghanistan, Yemen, and Syria. If there’s a reason liveblogs and live video do well, it’s because the audience now has an expectation of being to drill down into a topic, quickly. At the same time, the relative size of updates we receive on Twitter and Facebook are shorter than the average news story and have changed the atomic unit of news. How media organizations respond to that will determine their success online, Nanabhay said. One of the reasons Nanabhay is so bullish on liveblogs is because of the ability to thread all that information together to create cohesive stories. The value journalists can provide is as a curator of that information, but also delivering that news wherever readers are. That’s why alongside Twitter, Facebook, and YouTube, Al Jazeera English also is active on Reddit. It’s also why they launched The Stream, a show deeply immersed in social media. That’s “distributed distribution” in action, as a means for journalists to continue their work and build audiences. Al Jazeera English is a distributed network that reaches out to its audience wherever it is at any given moment. One of the reasons Nanabhay is so optimistic about a future where journalists and citizens collaborate in storytelling is because of the possibilities of technology. Thanks to smartphones, journalists and civilians alike are producing more media than ever before, which is something news outlets need to embrace and facilitate, Nanabhay said. Photo of Nanabhay from Joi Ito used under a Creative Commons license. POSTED March 26, 2012, 10:10 a.m.
Ellis, Justin. 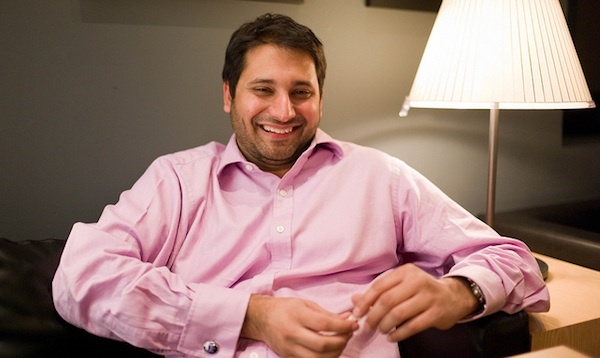 "Mohamed Nanabhay on Al Jazeera’s online growth and the future of news distribution." Nieman Journalism Lab. Nieman Foundation for Journalism at Harvard, 26 Mar. 2012. Web. 20 Apr. 2019. Ellis, Justin. "Mohamed Nanabhay on Al Jazeera’s online growth and the future of news distribution." Nieman Journalism Lab. Last modified March 26, 2012. Accessed April 20, 2019. https://www.niemanlab.org/2012/03/mohamed-nanabhay-on-al-jazeeras-online-growth-and-the-future-of-news-distribution/.